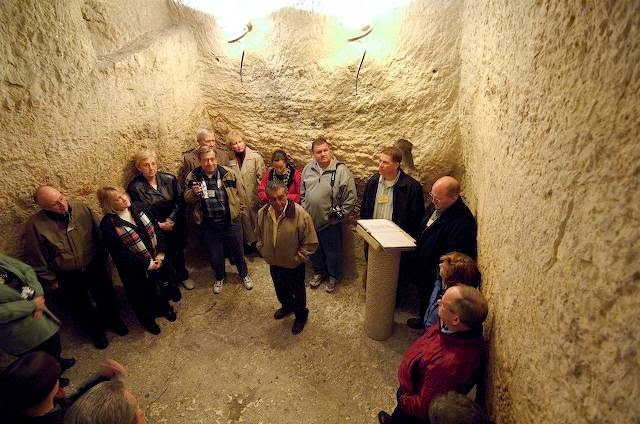 Image: Modern tourists visit a site which claims to be "The Dungeon at Caiphas' house"
And the men that held Jesus mocked him, and smote him (Luke 22:63). Luke begins: “And the men that held Jesus…” The verb here is synecho. In addition to simply holding, the verb also has the sense of to surround, to hem in, or to encircle. This is before the age when people thought anything about the humane treatment of prisoners or those in custody. In the first century you were guilty unless proven innocent and the punishment began even before your trial ended. Ironically, it is the life and teachings of the man they encircle that will result in humane treatment for those accused of crimes. Luke continues, saying “they mocked him [empaizo: ridicule, make fun of, trick, or deceive], and smote him [dero: beat, strike, hit].” We don’t know which was worse, the emotional abuse they inflicted or the physical abuse. I feel sure that no blow they laid upon him hurt as much, humanly speaking, than when his eyes locked on Peter’s at the moment of his third and emphatic denial (v. 61 a). Blows were laid upon our Lord that the eye could not see. And when they had blindfolded him, they struck him on the face, and asked him, saying, Prophesy, who is it that smote thee? (Luke 22:64). In v. 64 we see one example of both this emotional and physical abuse laid upon our Lord. The guards apparently had picked upon from the trial that Jesus was acclaimed as a prophet by the people. So, they thought it would be great fun to blindfold him [perikalypto] and to strike him in the face, all the while saying, “Prophesy, who is it that smote thee?” Get it? We complain about bullying today, but we don’t know what bulling is—what the bullying was like that our Lord underwent for our sakes. Their mockery reminds me of the Russian cosmonauts who went into space and reported they could not find God there, so he must not exist. Silly men. You prove nothing when you claim God does not exist, because you cannot see him. So these men prove nothing but their own spiritual darkness in mocking our Lord who is the perfect Prophet, Priest, and King. And many other things blasphemously spake they against him (Luke 22:65). Notice especially Luke’s conclusion in v. 65. The word that stands out here is the verb blasphemeo. Though it can mean to speak against, slander, or insult a man, the most powerful meaning of the verb, of course, is to speak sacrilegiously or profanely about God. What is Luke’s not so subtle point? To blaspheme Jesus is to blaspheme God, because Jesus is Lord! Perhaps Luke gave us this verse to alleviate our disgust at how Christ was so shamefully treated. The one whom these men scorn and ridicule, myriads will fall down before and worship.